An exciting new era for Speech & Drama at Grace Dieu! 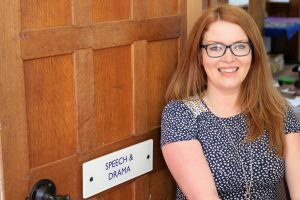 Starting in September, Grace Dieu is welcoming a new Speech & Drama teacher – Felicity Curtis. Felicity brings with her a wealth of educational experience that she will be passing on to pupils across all the years at Grace Dieu. She also has a string of professional acting credits to her name, having played a variety of roles from Ophelia in Hamlet, to Beverley in Abigail’s Party. She has performed in the West End, and worked professionally in both Theatre and Film. Felicity holds a degree in Performance and Live Art, from Nottingham Trent University, as well as an MA in Acting from the Mountview Academy of Theatre Arts & University of East Anglia, London. She has extensive LAMDA experience, having been a LAMDA Examiner for a number of years, as well as having previously taught the LAMDA syllabus at Magdalen College School, Oxford, and also at St Edwards School, Oxford. Her record is impeccable, with all of her pupils having achieved Merits and Distinctions under her tutelage. She has also taught Drama at Headington School, Oxford, been a Drama Facilitator for the YMCA, a Workshop Facilitator for the Creation Theatre Company and a Performing Arts Lecturer at New College Nottingham. Felicity will bring all of this experience to Grace Dieu as she prepares our pupils for their forthcoming LAMDA examinations and hopefully encourages even more pupils to take an interest in this area of the curriculum. If you are interested in your child taking lessons with Felicity please contact the School and we will be able to provide you with all the necessary details.